Set in Mill Farm Sports Village in Wesham, Bradleys Sports Bar is the first of its kind in the UK and is fast becoming the number one sports bar in the UK. Designed with the sports fan in mind, Bradleys Sports Bar is a great place to see all of the latest games. Take a look at our ‘What’s On‘ schedule for a full list of all of the sporting events we’ll be showing. With 4 independent viewing areas, you’ll be guaranteed an uninterrupted viewing of all your favourite sporting events in a sumptuous and comfortable environment. Come along and sample some of the fine cask ales we have available, or enjoy one of our delicious home cooked meals. All of our food is locally sourced, fresh and served with style. Bradleys Sports Bar is located just off junction 3 of the M55 at the Mill Farm stadium, home to AFC Fylde football club. To receive the weekly sports schedule of what we’re showing live at Bradleys each week, as well as news, special events and live music, follow us on Facebook, Twitter, or register for emails below. Pick up a Mill Farm gift card and treat someone to a meal, merchandise, or drinks. 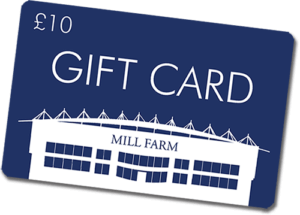 The Gift Cards can be used across any of our venues; Churchill’s bar, Bradleys Sports Bar, Milano’s Mediterranean restaurant, Aroma Cafe and the AFC Fylde shop.